Notes Part of the course takes place on a ship. Crescent Island is the second course of Sherbet Island in Diddy Kong Racing and its remake, Diddy Kong Racing DS. The track has a fork in the road at the initial part of the level where players may either take a Zipper on the left or collect balloons on the right. Then, the track curves to the right, where players can collect red or green balloons. Bananas are also next to the walls on the right. When the players exit the area, they can drive on a Zipper and collect more bananas. Further ahead is a pirate ship, where players can either drive directly through it, or they can enter an opening on top of it and continue onwards. There are bananas on the right, before the entrance on the pirate ship. Also, if players have a hovercraft, they can take a shortcut by riding around the ship, instead of going on it. 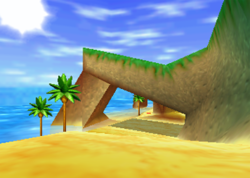 Near the end of the track is another shortcut where players must take a sharp right to achieve without crashing into a sandy spike in the ground. A hidden key is also in this course. To find it, players must go left into the ocean in at the first fork in the road. An X mark can be seen on the wall with the key under it. The key allows players to play at the challenge level, Darkwater Beach. In the Nintendo DS remake, the track is mainly the same. However, the key is found in a different location to the original. It is to the left after players finish the first fork in the road. The musical score of Crescent Island is one of two courses whose theme plays in the end credits, the other one being Darkmoon Caverns's theme. This page was last edited on December 18, 2018, at 21:28.